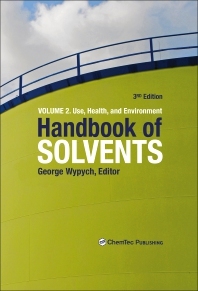 Handbook of Solvents, Volume Two: Use, Health, and Environment, Third Edition, contains the most comprehensive information ever published on solvents and an extensive analysis of the principles of solvent selection and use. The book is intended to help formulators select ideal solvents, safety coordinators protect workers, and legislators and inspectors define and implement public safeguards on solvent usage, handling and disposal. The book begins with a discussion of solvent use in over 30 industries, which are the main consumers of solvents. The analysis is conducted based on available data and contains information on the types of solvents used and potential problems and solutions. In addition, the possibilities for solvent substitution are also discussed, with an emphasis on supercritical solvents, ionic liquids, ionic melts, and agriculture-based products.